On this day, 75 years ago, the re-dedication of a church associated with the settlers of the Limestone Plains and a significant event in Australia's military history occurred. 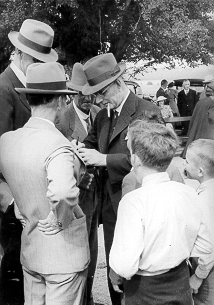 For wartime Prime Minister John Curtin it was a day that reinforced for him the importance of defending the society the pioneers had created - the brotherhood of man. Shortly after the Reverend Hector Harrison arrived in Canberra in 1940, to take up duty at St. Andrew’s Presbyterian Church in Forrest, he noticed the little stone church on the road to Yass. It was the original Canberra Presbyterian Church, constructed in the 1870s, but in 1940 was being used as a barn by the Southwell brothers, Fred and Jack, lessees of the property, Fern Hill, on which it stood. Harrison sought and gained the agreement of the Department of Interior and the Southwell brothers to use the old church for its original, spiritual purposes. Location of St Ninian's Church (red dot) on Yass Road. Freehold portions (shaded) held by Presbyterian adherents in 1910. By Sunday, 15 February 1942, the church was ready to be re-dedicated as St. Ninian’s. Present were several old parishioners and members of the pioneering families who built the church. What made the ceremony notable are both its timing and the presence of the Prime Minister, John Curtin. Why would a self-confessed agnostic like Curtin be present at a religious event, at what was then a small church in the bush, during the tumultuous period of early 1942? Curtin was good friends with the Southwell brothers and their sister, Bella Southwell, who was manager of the Hotel Kurrajong where Curtin and other parliamentarians often stayed. Near his death Curtin spoke about the pleasure of roaming around Fred Southwell’s paddocks and he actually attended the wedding of Southwell’s daughter Thelma, where he proposed a toast to the newlyweds. Mr Harrison, a fellow West Australian, presided over the wedding and it was probably then that he invited the Prime Minister to the re-dedication ceremony. Curtin was prevailed upon to say a few words after the church service. Curtin believed that it was “the hardest speech he ever had to make in his life” (Day, page 494). He reflected on how the communities of the early pioneers developed and the importance of churches as a meeting place. “The church”, he said, “had become a very important place, for there they had learned to share one another’s troubles”. How he must have wanted to share his own troubles for, on that very day, thousands of Australian troops stationed at Singapore became prisoners of war when the ‘fortress’ island fell to the Japanese. Curtin added: “The fatherhood of God was closely related to the brotherhood of man”. Before he died Curtin asked Harrison to conduct his funeral service. Harrison hesitated because Curtin’s agnosticism created doubts in his mind, but for proof of Curtin’s spiritualism he turned to the words the Prime Minister used at St. Ninian’s in 1942. Those words must have impressed Mr Harrison. He also used them during Curtin’s funeral service. This article is also available on the Stories from the ACT Memorial web page. Day, David, John Curtin, a life, Harper Collins, Pymble, 2006.